Commercial truck drivers may be experienced behind the wheel, but all it takes is one mistake to cause a fatal accident. In 2014, 587 large truck occupants died in wrecks, according to the Insurance Institute for Highway Safety. That same year, 2,485 passenger vehicle occupants died in collisions with large trucks. If you were injured by a negligent driver in Kentucky, contact the Troutman Law Office. Matt Troutman is an accident lawyer in Louisville who can help you pursue the maximum settlement. Call 502-805-0321 to schedule a free case evaluation with an accident attorney. You can also visit http://car-accident.usattorneys.com/kentucky/ to learn more about personal injury claims in Kentucky. Electronic Stability Control can help drivers regain control of their vehicles if they start skidding. ESC uses sensors to identify the early stages of a skid. The system applies small amounts of pressure to the brakes in order to help the truck regain traction. According to the National Highway Traffic Safety Administration, Electronic Stability Control can reduce the risk of rollover crashes. Wearing a seat belt is still the most effective way to reduce the severity of injuries in the event of an accident. Seat belts can prevent a vehicle occupant from being ejected, which significantly increases the risk of dying. They also help truckers avoid collisions by putting them in an ideal position to react to unexpected hazards. Driver and passenger airbags can prevent head injuries. 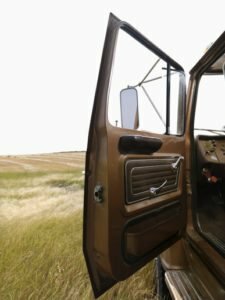 Most modern trucks now have advanced side and front airbags that inflate at the moment of impact and prevent the head from hitting the dashboard, steering wheel or windows. ABS has been a common feature in sedans for many years, and it is now standard in most commercial trucks. Anti-lock braking systems prevent the wheels from locking up and help drivers avoid skidding. Most ABSs feature wheel speed sensors, an electronic control unit and two hydraulic valves. If the system detects that a wheel is rotating slower than others – a condition that is conducive to wheel lock – then the valves reduce hydraulic pressure to slow down that wheel. Conversely, if a wheel is moving too fast, the system increases hydraulic pressure to speed up the affected wheel. A swaying trailer can cause a truck to roll over or to swerve off the road. Automatic trailer sway control can detect the early stages of sway and make automatic adjustments to straighten the vehicle and improve handling. If you were in a crash caused by a reckless driver in Kentucky, contact the Troutman Law Office. Matt Troutman is a Louisville personal-injury attorney who can handle the legal aspects of your claim so you can focus on recovery. Mr. Troutman can evaluate your case, interview witnesses, gather evidence, structure your claim and handle settlement negotiations on your behalf. Call to schedule a free case evaluation.